Lee, David. "Gaspé Peninsula". The Canadian Encyclopedia, 02 August 2018, Historica Canada. 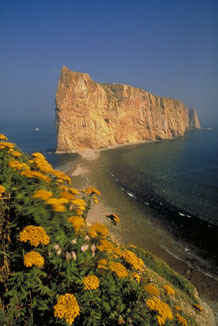 https://www.thecanadianencyclopedia.ca/en/article/gaspe-peninsula. Accessed 22 April 2019. The name Gaspé probably derives from a Micmac word meaning "land's end." When Jacques Cartier landed in Gaspé Bay in 1534 to plant a cross and claim the land for the king of France, he found the area occupied by Iroquoian-speaking Indigenous people. Percé is one of Canada's foremost tourist attractions and an important bird sanctuary in eastern Québec (photo by Thomas Kitchin). 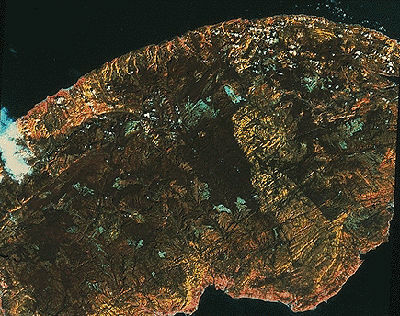 This satellite image of the Gaspé Peninsula in eastern Québec shows that it is a rugged extension of the Appalachian Mountain chain, which stretches all the way to Alabama (courtesy Canada Centre for Remote Sensing). The Gaspé Peninsula (or Péninsule de la Gaspésie in French) is a large peninsula in eastern Québec jutting out into the Gulf of St Lawrence. Part of the Appalachian Region, its elevation is higher in the northern part of the peninsula - Monts Chic-Choc with lesser elevations towards its southern coast. Mont Jacques-Cartier at 1268 m is the highest point both on the peninsula and of the Appalachian Region in Canada. 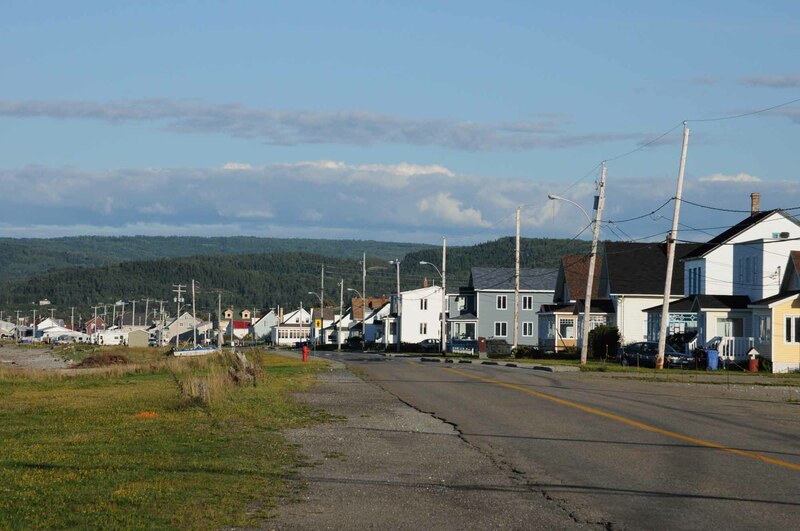 Except for the copper-mining town of Murdochville, most of the population lives along the lengthy coastline within a few kilometres of the St Lawrence River, the Gulf of St Lawrence and Chaleur Bay. Principal towns include New Richmond, Gaspé and Matane. 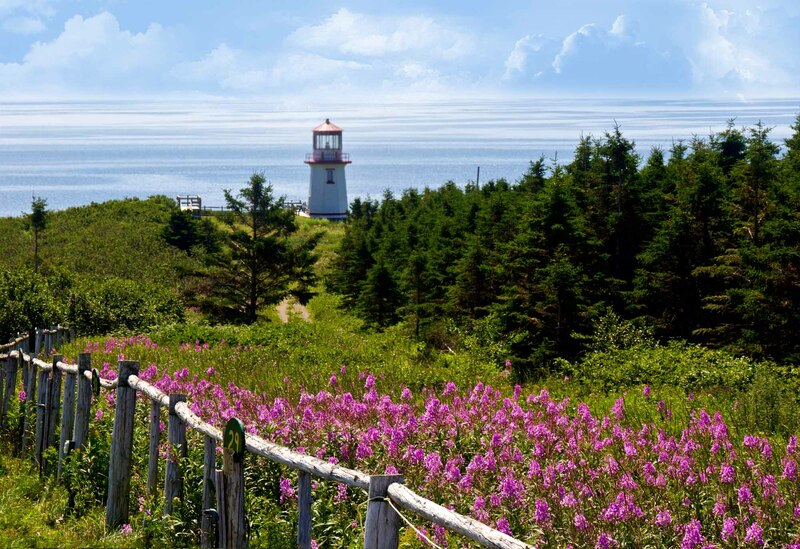 The name Gaspé probably derives from a Micmac word meaning "land's end." When Jacques Cartier landed in Gaspé Bay in 1534 to plant a cross and claim the land for the king of France, he found the area occupied by Iroquoian-speaking native people. 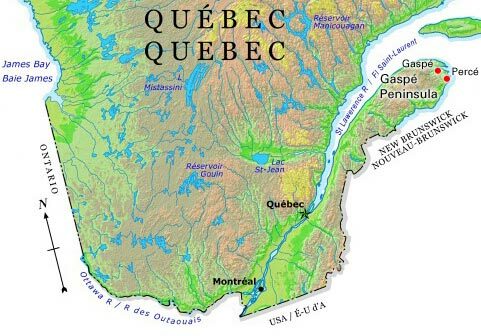 By the beginning of the 17th century, when Samuel de Champlain sailed along its coasts, the peninsula was inhabited by Micmac. Although never probably numbering more than a few hundred, they have continued to live there since. They were Christianized by French missionaries in the 17th century. \r\nPainting shows both sailing ships and a steamship in the harbour of Gaspé, Québec, with the buildings of the Robin and Le Boutilier trading companies in the background. Canada, Quebec, the small village of Cap Chat in Gaspésie. Local flora in Gaspésie, QC. \r\nImage: Davida Aronovitch/Historica Canada. The rich supplies of codfish, found in great numbers only a few kilometres from shore, were long the focus of the Gaspé economy; every year, for centuries, hundreds of tonnes of fish were shipped to Europe, South America and the US. The wide, stony beaches and reliable sun and winds of Gaspé were perfect for dry-curing the cod; until refrigeration arrived in the 20th century, this was the only means to ensure that the fish would endure the long voyages to market without spoiling. In the French period only a few fishermen settled in Gaspé permanently. When James Wolfe and his forces arrived in 1758, they found about 400 permanent residents on the coast. He destroyed their homes and possessions and sent most of them back to France. Still, a few managed to hide in the woods, continuing to live in Gaspé after it became British territory in 1763. They were joined by several families of Acadians who had avoided the British deportation campaign in Nova Scotia. 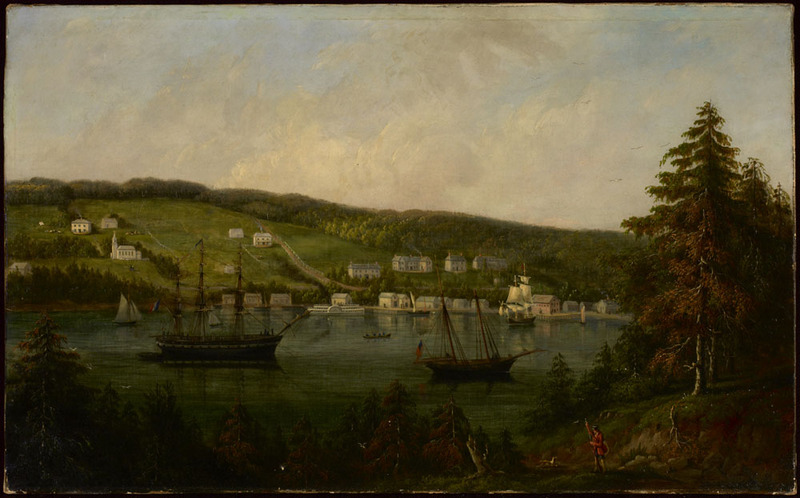 In 1784 about 400 English-speaking Loyalists, refugees from the American Revolution, came to settle in Gaspé. Thereafter, few immigrants arrived, though the population grew vigorously by natural means. It was a long time before the people of Gaspé escaped dependence on the fishing industry. A little mixed farming was practised in Bonaventure County, but it was not until the 20th century that the forest and mineral resources of the interior were seriously exploited. Construction of a railway connection only began in the 1890s. In recent years tourism has become an important source of employment - particularly after the collapse of the cod fishery in the early 1990s. The rivers of the Gaspé are clear and are well known for salmon. 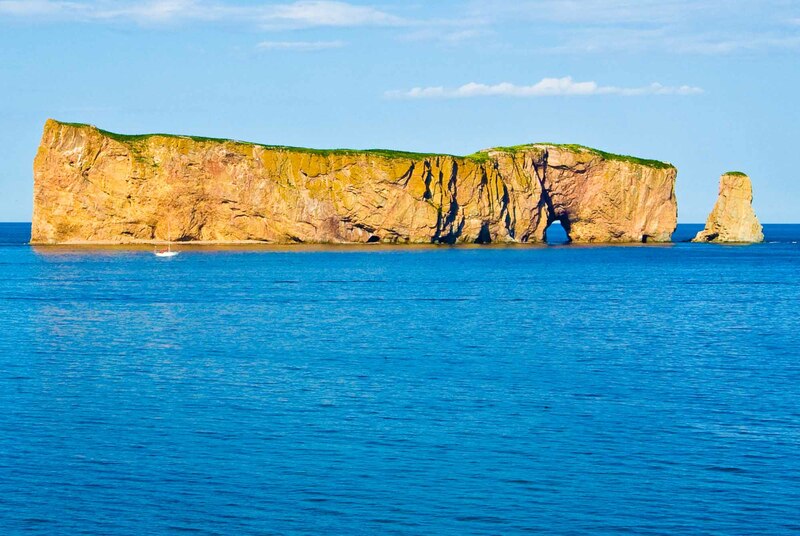 Thousands of visitors come to see the famous Percé Rock, the great bird colonies of Île Bonaventure, Parc de la Gaspésie in the rugged interior and Forillon National Park.